Don't Starve Together is the standalone multiplayer expansion of the uncompromising survival game Don't Starve. Very Positive (883) - 93% of the 883 user reviews in the last 30 days are positive. Overwhelmingly Positive (67,651) - 96% of the 67,651 user reviews for this game are positive. Includes an extra copy of Don't Starve Together. Send it to a friend! Hey everyone! Today we are launching Wortox, please enjoy! A playful imp with a colourful past, Wortox was once a gentle (if rascally) forest creature without a care in the world -- until the day he inherited a terrible curse, and lost a close friend. Unlike the other Survivors, he does not appear to be trapped in the Constant. Perhaps he views this as some sort of game? Wortox the Soul Starved has hopped his way into the Constant to join our intrepid band of Survivors. He’s a fun, mischievous fellow with a big, kind heart… minus the fact that he eats souls for sustenance. Wortox catches the Souls of creatures that die around him. Wortox can eat delicious souls (then loses some sanity). Wortox teleports a short distance. Release Souls to heal nearby allies. Unfortunately for Wortox, his body craves Souls. Food is only ½ as sustaining. Wortox can be overloaded with Souls, causing him to drop them and lose sanity. Wortox is less afraid of monsters. As with Winona, we will likely be tuning Wortox with balance adjustments in the future. Please let us know your thoughts and feedback! Wortox is available for purchase for $6.99, in the Wortox Chest. Wortox’s Survivor skin set is included in this chest for free. The Wortox Deluxe Chest is $10.99 and includes the Survivor, Minotaur and Uncorrupted skin sets. You can weave Wortox for 2700 spool. Unfortunately we hit a bit of a snag. XboxOne will get the update today but we aren't able to get it out today for PS4. It's possible we can have it out tomorrow, but we expect it to come next week. We're sorry for the delay. New to this release, our in-house Chinese specialist has reviewed our entire string library (more than 25,000 strings!) and we are now officially supporting Simplified Chinese. If you have any feedback on our translation, we would be happy to hear it. At the end of April we are planning to release the first major game update. This first update will be focused on laying the groundwork for more content. In addition, the next character to be refreshed will be Willow, launching at the same time as the game update. Armor will no longer take damage when evading an attack during Soul Hop. Sand Spikes, Relics, Balloons, Meat Bulbs, and Nightmares will no longer spawn Souls. Sand Spikes, Relics, and Balloons will no longer trigger Abigail or Wigrid’s Battleborn. Minor fixes in Wortox’s speech strings. Minor fixes for Chinese translations. Creatures that die in traps near Wortox will now spawn souls. Fixed animation layering bugs during Soul Hop. Fixed various Wortox skins bugs. Improved error dialog for deleted accounts. Hey everybody. We're a little bit later than we had anticipated, but we wanted to let you know that first new character DLC will come to Don't Starve Together March 28th. Wortox the Soul Starved will soon hop his way into the Constant to join our intrepid band of Survivors. He’s a fun, mischievous fellow with a big, kind heart… minus the fact that he eats souls for sustenance. 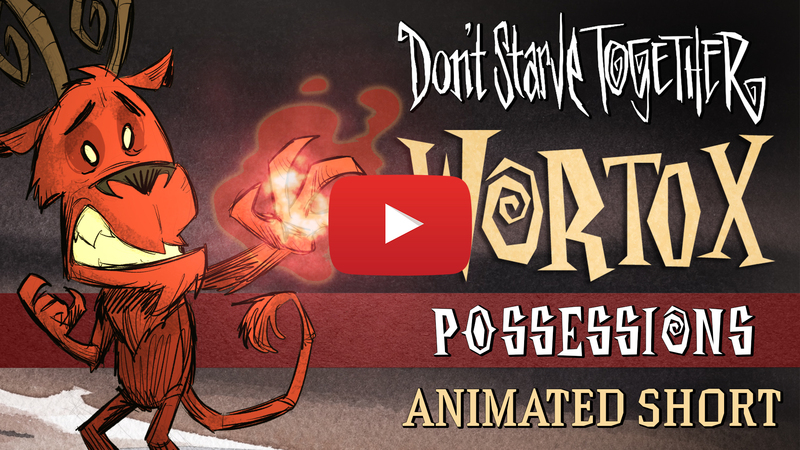 We will have a new Wortox animated short and more details on March 28th! Sorry that you have to wait a little longer. 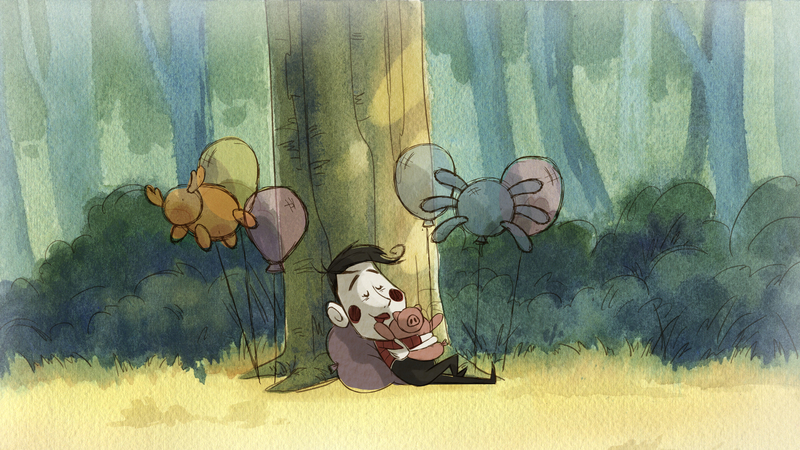 But for now to a tease for Wortox's animated short, please enjoy Wes peacefully napping by a tree. 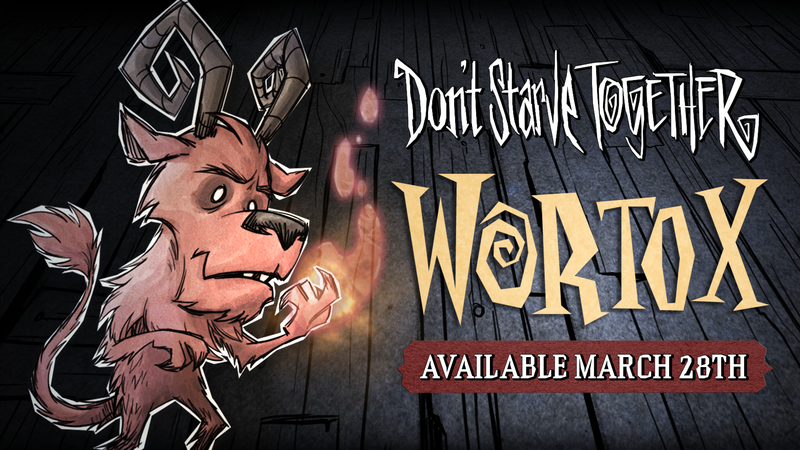 Wortox the Soul Starved has hopped his way into the Constant and is ready to get up to all sorts of fun and mischief! With this Deluxe Chest, you’ll unlock this new playable character and his entire wardrobe of three extra skins. Hyuyu! Don't Starve Together is the standalone multiplayer expansion of the uncompromising wilderness survival game, Don't Starve. Do whatever it takes, but most importantly, Don't Starve. 1,281 Curators have reviewed this product. Click here to see them.